This name uses Portuguese naming customs. The first or maternal family name is Vilar and the second or paternal family name is Braamcamp Sobral. Sobral was born in Lisbon and has lived there most of his life. 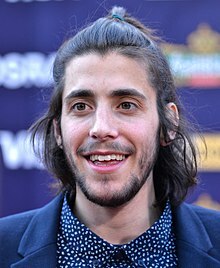 He was born into a formerly noble family, the son of Salvador Luís Cabral Braamcamp Sobral and Luísa Maria Cabral Posser Vilar. His paternal grandparents are Salvador José de Almeida Braamcamp Sobral and Maria Elisa Perestrelo de Matos de Figueiredo Cabral; and his maternal grandparents are João Luís Posser de Andrade Vilar and Luísa Maria de Melo Breyner Freire Cabral. The politician Hermano José Braamcamp de Almeida Castelo Branco is his great-great-great-great-grandfather. At the age of ten, he participated in the TV programme Bravo Bravíssimo, and at 20 he was one of the ten finalists of Ídolos, the Portuguese version of the Idols franchise. As a finalist, he sang music by Stevie Wonder, Leonard Cohen and Rui Veloso. He studied Psychology at the Instituto Superior de Psicologia Aplicada [pt], in Lisbon, which he abandoned to pursue a degree in music. He spent time in Mallorca as an Erasmus student, where he sang in bars. In 2009, he competed on season three of Ídolos, Portugal's version of the Idols franchise. He finished seventh in the competition. His sister, Luísa Sobral, is also a singer who previously placed third on season one of Ídolos. Salvador Sobral, accompanied by pianist Júlio Resende, in the FOLIO festival in Óbidos, singing poems by Alexander Search (one of Fernando Pessoa's heteronyms). After he left the Psychology program, he applied to the Taller de Músics, a music school in Barcelona, where he finished his studies in 2014. In 2015, he participated in the Vodafone Mexefest and EDP Cool Jazz festivals. During this time, Sobral traveled through several cities in Spain and among them, Tenerife, where he performed at a private party of a wealthy couple. On 2 August 2016, Sobral released his debut single "Excuse Me" as the lead single from his debut studio album. On the same day he released his debut studio album Excuse Me. The album peaked at number 10 on the Portuguese Album Chart. "Nem Eu" was released as the second single from the album on 27 October 2016. In 2017, Sobral was confirmed to be taking part in Festival da Canção 2017, with the song "Amar pelos dois". He went on to win the competition on 5 March 2017, and represented Portugal in the Eurovision Song Contest 2017. Sobral could not perform in the first rehearsals because of a heart condition and an operation that forced him to rest ahead of the performance in the semi. His sister took over the role of singer during the first rehearsals. He won the final with 758 points, which under the current voting system represents the highest scoring winner in the history of the contest. In July 2017, he participated in the Super Bock Super Rock festival in Lisbon, fronting rock group Alexander Search, a project he shares with pianist Júlio Resende and other musicians - the band plays music inspired by the work by Portuguese poet Fernando Pessoa. In 23 April 2018 he received - along with his sister, Luísa Sobral - the Portuguese Order of Merit, both receiving the medals of Commanders (ComM). This honorific award was given by the Portuguese president himself, Marcelo Rebelo de Sousa. In May 2018 Sobral performed in the Grand Final of the 2018 Eurovision Song alongside Brazilian musician Caetano Veloso. On 29 March 2019 his second studio album "Paris, Lisboa" (Paris, Lisbon) was released in 13 countries, he sings in 4 languages on it. Salvador Sobral is a fan of Chet Baker and bossa nova singers including Caetano Veloso and Chico Buarque. He speaks six languages: Portuguese, Spanish, English, Catalan and some Italian. In 2019, he started to learn Swedish, as he is a fan of film-maker Ingmar Bergman. Sobral married French actress Jenna Thiam in a small ceremony in Lisbon on 29 December 2018. On 5 September 2017, Sobral announced via Facebook that he would interrupt his career temporarily due to health concerns, following a last concert on 8 September, in the gardens of Casino Estoril, in Cascais. "It is not a secret that I have a fragile health; I have a problem. It is, unfortunately, time to hand over my body to science and to abandon my life of concerts and music; time to leave for a while from this civilian world and go to another where, certainly, my problem will be fixed. Unfortunately, I do not know how long this will take." On 8 December 2017, Sobral underwent a successful heart transplant. He left hospital in January 2018, with doctors telling him to "take life quietly" and "keep away from crowds". Sobral wearing the "S.O.S. Refugees" shirt. Sobral drew attention to the European migrant crisis by attending the first semi-final winners' press conference in an 'S.O.S. Refugees' shirt. "If I'm here and I have European exposure, the least thing I can do is a humanitarian message," he said. "People come to Europe in plastic boats and are being asked to show their birth certificates in order to enter a country. These people are not immigrants, they're refugees running from death. Make no mistake. There is so much bureaucratic stuff happening in the refugee camps in Greece, Turkey and Italy and we should help create legal and safe pathways from these countries to their destiny countries," he added, earning a round of applause. The EBU banned him from wearing the shirt for the remainder of the contest. The EBU argued that Sobral's shirt was being used as a "political message", violating the rules of the contest. Sobral argued at his winners' press conference, however, that it held a humanitarian message, not political one. During a concert in Ourém, Sobral announced on 19 June 2017 that he would donate all the profits from the sales of his CDs sold, to the people of Pedrógão Grande and the relief efforts in the town after it was severely damaged by wildfires the previous day. Commander of the Order of Merit (23 April 2018). ^ CNN, Laura Smith-Spark and Steve Almasy. "Portugal's Salvador Sobral wins Eurovision Song Contest". CNN. Archived from the original on 16 May 2017. Retrieved 2017-05-17. ^ Laura Smith-Spark and Steve Almasy. "Portugal's Salvador Sobral wins Eurovision Song Contest". CNN. Archived from the original on 13 May 2017. Retrieved 14 May 2017. ^ "Full coverage: Eurovision 2017". BBC. 13 May 2017. Archived from the original on 14 May 2017. Retrieved 13 May 2017. ^ "António Braamcamp Sobral, 6º conde de Sobral". ^ "Wie is Salvador Sobral, de winnaar van het Songfestival? Hartendief met hartproblemen". 14 May 2017. ^ "BLITZ – Salvador Sobral no "Ídolos": recorde o vencedor do Festival da Canção a cantar Maroon 5, Stevie Wonder ou Rui Veloso". Retrieved 13 May 2017. ^ a b c d Group, Global Media (9 May 2017). "Salvador Sobral – O vencedor que nunca tinha visto um festival da canção". Archived from the original on 9 May 2017. Retrieved 13 May 2017. ^ "A hora da decisão final no Festival da Canção". Jornal de Notícias. 5 March 2017. Archived from the original on 5 March 2017. ^ "O Tivoli foi a casa de Luísa Sobral, Comunidade Cultura e Arte" (in Portuguese). Archived from the original on 21 February 2017. Retrieved 6 March 2017. ^ musicfest.pt, Equipa. "Salvador Sobral – Vodafone Mexefest 2015 – 28 Novembro 2015 – musicfest.pt". Retrieved 13 May 2017. ^ "Salvador Sobral e HMB vão actuar no EDP Cool Jazz". Archived from the original on 12 March 2017. Retrieved 13 May 2017. ^ Mucha, Martín (1 June 2018). "Salvador Sobral: "Yo quería tener un corazón andaluz"". El Mundo (in Spanish). Lisboa: Unidad Editorial. Retrieved 22 June 2018. ^ "Conheça os intérpretes da 1.ª Semi-final do Festival da Canção 2017". RTP.pt (in Portuguese). 18 January 2017. Archived from the original on 31 January 2017. Retrieved 18 January 2017. ^ Foster, Luis (6 March 2017). "PORTUGAL: SALVADOR SOBRAL WINS FESTIVAL DA CANÇÃO 2017 WITH "Amar pelos dois"". wiwibloggs.com. Archived from the original on 6 March 2017. ^ a b Benny Royston (5 May 2017). "Portugal predicted to win the first Eurovision semi-final". Metro. Archived from the original on 5 May 2017. Retrieved 14 May 2017. ^ "Eurovision 2017: Portugal's ballad wins contest". BBC News. 2017-05-14. Retrieved 2017-06-02. ^ "BLITZ – Salvador Sobral no Super Bock Super Rock". Jornal blitz (in Portuguese). Retrieved 2017-05-16. ^ a b "Eurovisão. Irmãos Sobral nomeados comendadores por "êxito singular"". PÚBLICO (in Portuguese). Retrieved 2018-04-23. ^ "Salvador Sobral performs with Caetano Veloso at the Grand Final of the 2018 Eurovision Song Contest". ^ "Salvador Sobral (Portugal) interview @ Eurovision 2017 – wiwibloggs". YouTube. Archived from the original on 12 May 2017. Retrieved 14 May 2017. ^ "ESC-vinnaren Salvador Sobral: "Jag älskar att plugga svenska"". SVT Nyheter. 8 March 2019. Retrieved 8 March 2019. ^ Adams, William Lee (2 January 2019). "Salvador Sobral marries French actress Jenna Thiam at private wedding in Lisbon". Wiwibloggs. ^ "Salvador Sobral se casa por sorpresa con la actriz francesa Jenna Thiam" (in Spanish). ABC. 2 January 2019. ^ Albernaz, Ana (2 January 2019). "Salvador Sobral casou-se em segredo com Jenna Thiam" (in Portuguese). SELFIE. ^ "Salvador Sobral anuncia pausa na carreira por motivos de saúde" [Salvador Sobral announces break in his career due to his health]. Público (in Portuguese). Retrieved 2017-09-06. ^ "Salvador Sobral está a recuperar bem" (in Portuguese). RTP. Retrieved 9 December 2017. ^ "Salvador Sobral leaves hospital following heart transplant surgery - but "there can be no hugs"". Portugal Resident. 12 January 2018. Retrieved 5 March 2018. ^ "Eurovision Song Contest 2017 – Winners' press conference – First Semi-final". YouTube. Archived from the original on 9 May 2017. Retrieved 13 May 2017. ^ "Eurovision contestants share emotions after qualifying for final". Kyiv Post. 10 May 2017. Archived from the original on 12 May 2017. Retrieved 13 May 2017. ^ a b Herbet, Emily (13 May 2017). "Portugal: EBU Ban Salvador Sobral from Wearing "S.O.S Refugees" Jumper". Eurovoix. Archived from the original on 16 May 2017. Retrieved 13 May 2017. ^ Granger, Anthony (13 May 2017). "ESC'17: The Winners Press Conference – Portugal Salvador Sobral". Eurovoix. Archived from the original on 16 May 2017. Retrieved 13 May 2017. Albums: "portuguesecharts.com – Discography Salvador Sobral (Albums)". Hung Medien. Retrieved 13 March 2017. Singles: "portuguesecharts.com – Discography Salvador Sobral (Singles)". Hung Medien. Retrieved 1 June 2017. ^ a b "austriancharts.at – Discographie Salvador Sobral". Hung Medien. Retrieved 25 May 2017. ^ a b "ultratop.be/nl – Discografie Salvador Sobral". Hung Medien. Retrieved 19 May 2017. ^ "ultratop.be/fr – Discographie Salvador Sobral". Hung Medien. Retrieved 19 May 2017. ^ a b "dutchcharts.nl – Discografie Salvador Sobral". Hung Medien. Retrieved 19 May 2017. ^ "spanishcharts.com – Discography Salvador Sobral (Albums)". Hung Medien. Retrieved 24 May 2017. ^ a b "hitparade.ch – Discographie Salvador Sobral". Hung Medien. Retrieved 24 May 2017. ^ "Top 100 Albums: Semana 14". Productores de Música de España. Retrieved 9 April 2019. ^ "lescharts.com – Discographie Salvador Sobral". Hung Medien. Retrieved 20 May 2017. ^ "offiziellecharts.de – Discographie Salvador Sobral". GfK Entertainment. Retrieved 19 May 2017. ^ "spanishcharts.com – Discography Salvador Sobral (Singles)". Hung Medien. Retrieved 24 May 2017. ^ "swedishcharts.com – Discography Salvador Sobral". Hung Medien. Retrieved 19 May 2017. ^ "Salvador Sobral | Full Official Chart History". Official Charts Company. Retrieved 19 May 2017.